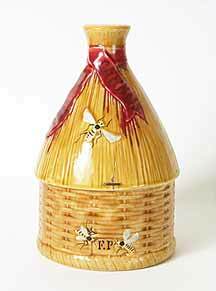 Honeypot - 7" (177 mm) high. This item is unmarked, but could be Wemyss or Wedgwood. The repair, which can be clearly seen on the front of the lid, is very old.